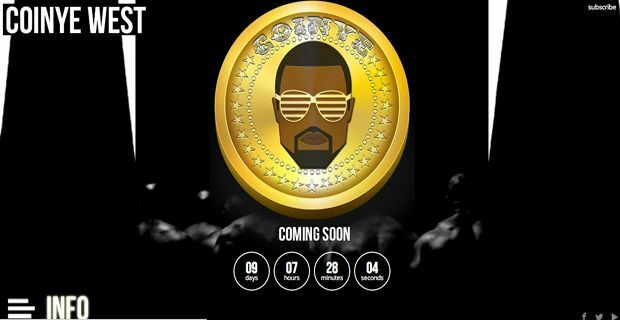 The digital matrix has taken a surreal twist with the launch of a new crypto currency called – ahem – Coinye West. The obvious conclusion is that it’s just another Tuesday in the intergalactic nebula that is Kanye West’s ego and he has launched his own currency before pronouncing himself Emperor of Infinity and insisting he be addressed as the Prophet Zorb. And yet the currency apparently has absolutely no affiliation with the down to earth rapper. Which does rather beg the question – what on earth are its creators up to? Well their stated plan is to ‘bring cryptocurrency to the masses’ and much of their pre release chatter is centred on painting Bitcoin as an elitist digital currency, ensconced in an ivory tower of complexity and astronomical value. Coinye will use a different algorithm from Bitcoin’s that will let people use their home computers to ‘mine’ coins rather than having to buy specialised hardware. The name of this mining software will predictably be “Gold Digger,” and while one cannot help but applaud their levelling mission, one does wonder about the security implications. In fact one wonders about a lot more than just the security implications. Yes it’s hilarious – Coinye West – chuckle chuckle – but how long for? The implied irreverence in the name is at once ‘very internet’ but at the same time rather distasteful, not least for those who view crypto currency as an open source revolution in exchange, financial models, and political liberty that opens an lucid alternative to a disturbingly corrupt global financial system. Minting some bling egomaniac onto the virtual coins somehow seems like the first step in the co-option of the concept by the forces of triviality. And while there’s a couple of nods to West’s supposedly ‘Illuminati’ credentials, they are also offering Kanye 100,000 of the new coins to name drop their product , which does really say it all about the venture. Who needs a shadowy cabal when you have vacuous celebrity and a brand driven culture?